Deeply rooted in the history of Harvard, and with programs today in the Yard, in the Houses, in all of Harvard’s graduate and professional schools, and at Rosovsky Hall, Harvard Hillel bears out the vision of Rabbi Ben-Zion Gold, of blessed memory, who insisted that Jewish life move “from the periphery to the center.” Harvard Hillel continues a strong tradition of inspiring Jewish self-confidence at Harvard, of placing Jewish thought, culture, tradition, and values at the heart of the University, and of cultivating young Jewish leadership. With Jewish identity more diverse and Harvard more global than ever, Harvard Hillel proves that a Jewish center can have powerful meaning on the map of a great University and on the personal map of every Harvard student. Through Harvard Hillel, students share Jewish traditions with friends of all origins and nationalities. They connect the ideas of Jewish heritage with the issues of today. Through Harvard Hillel, Israeli Harvard students share their country with peers of all faiths and backgrounds on trips with stellar itineraries. Jewish students strengthen bonds to Jewish community, to Israel, and to one another through myriad activities, through travel, and through conversations on campus featuring prominent faculty and guests. Harvard Hillel nurtures a broad array of Jewish religious self-expression; and Harvard Hillel reaches out to students of all walks of Jewish life, and to the whole University. A programmatic mission grounded upon Jewish education, pluralism, leadership, and connection with Israel now realizes something else as well—the potential of Jewish community to be relevant and meaningful to all at Harvard. At the time of its founding, some 75 years ago, Harvard Hillel served only Jewish students, who did not always find welcome in the University’s other clubs and social circles. Later, Harvard Hillel picked out and cultivated extraordinary leaders from among a large Jewish student population fully integrated throughout Harvard and constituting at least a quarter of the College. 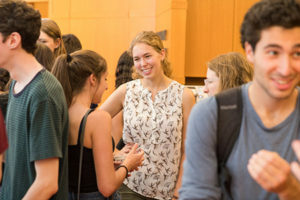 Today diversification has reduced Jewish enrollment in Harvard College to around twelve percent—and Harvard Hillel reaches out to everyone, so that Jewish life and culture can be accessible and inspiring in the University entire. Constructed twenty-five years ago, Rosovky Hall, Harvard Hillel’s ‘new building,’ is now an overflowing gathering place, often bursting at the seams. Over 50,000 meals are served in Harvard Hillel’s Rabbi Ben-Zion Gold Dining Hall each year, to Jewish students and their classmates, roommates, athletic teammates, and friends. Renewing Rosovsky Hall is an important step in guaranteeing a vital Jewish future at Harvard University and ensuring that future generations continue to create Jewish life here and beyond. 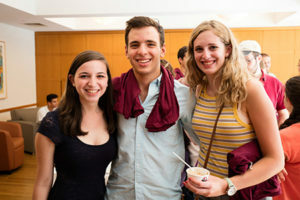 Physical space is essential—but no factor is more influential in the emergence and expression of identity than the friendships one forges at the formative stage of young adulthood; and Harvard Hillel is a welcoming and widely beloved hub of friendship and of shared meaning-making at the heart of Harvard. It is no accident that significant leaders in Jewish life continue to emerge from Harvard Hillel, and that several leading Harvard faculty members today attribute the origins of their academic careers to explorations that began at Harvard Hillel. We must seize the opportunities and build on the proven successes we have pioneered, and we must shape the future of our world at this vital intersection of Harvard and Jewish life. Harvard Hillel is an outgrowth of Harvard itself, a legacy shaped and bequeathed to us by many Harvard generations. We carry forward principles true to this history—Jewish self-confidence, the legitimacy of many different modes of Jewish self-expression, a living bond with Israel, and the capacity of Jewish life to be relevant and inspiring in the heart of a great University. 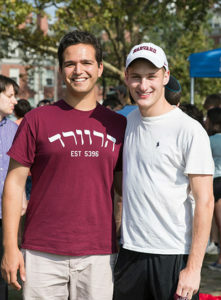 Alumni and supporters who have known Harvard Hillel in its past iterations, and who value what it is today, can take part now in ensuring that Harvard Hillel continues to grow and thrive at the core of Harvard, for a new generation—and onward!